This is a great role playing game in which you will have to make your character the strongest warrior from the swamp. Form all the creatures there you have the biggest potential. Do your best to help the town chief aid the warriors in combat and if he will see that you are doing great maybe he will help you get on track. Earn money by doing missions and you will be able to buy new gear that will make you much stronger. Also you can level up and gain more skill points that will allow you to kill the enemies faster. Show the chief you are a good warrior and you will be the one who will head into combat first. Use WASD to move, space and the mouse to interact. 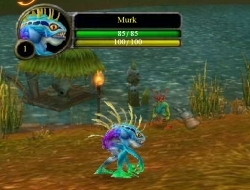 Murloc 0.00 between 0 and 10 based on 0 votes.